International Women’s Day presents an opportunity to celebrate the progress women have made in society, and a time to reflect on the steps still needed to make a more gender equal world. This year’s theme is ‘Be Bold For Change – help forge a better working world – a more gender inclusive world’. For International Women’s Day, the Youth Engagement team focused on creating an opportunity to encourage and support young women develop their skills in fields typically dominated by males, including science, technology, engineering, arts, and maths (STEAM), as well as trades. 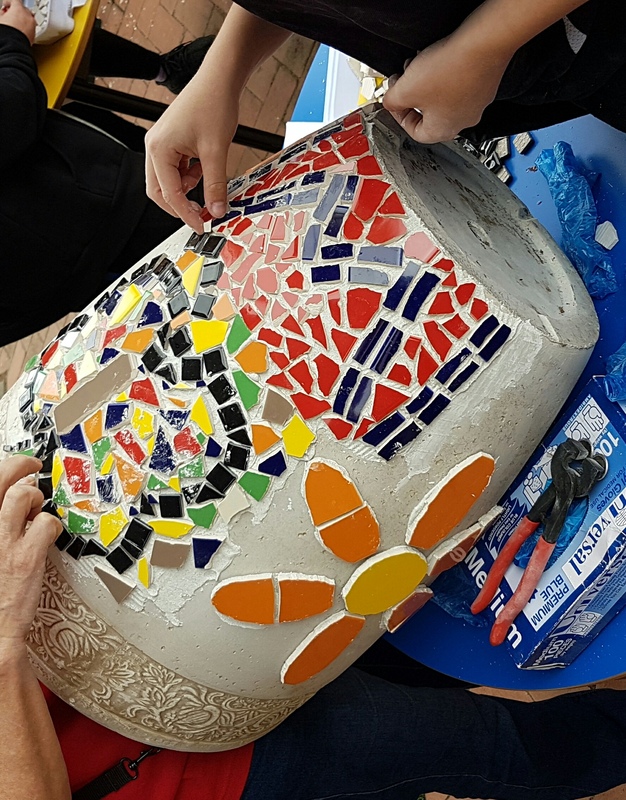 To facilitate this, the Youth Engagement team partnered with Bunnings Warehouse Tuggeranong, and six enthusiastic female students at Caroline Chisholm Senior Campus to contribute something to their ‘Bali Garden’. The Youth team and Bunnings Warehouse consulted with the young girls about their interests, the skills they wanted to develop, and what they wanted to contribute to the school’s garden. From these conversations, it was decided that two large pots would be decorated in a mosaic. We spent the day learning about mosaic design, how to cut and lay tiles, and working together to create a pot that represented them, all the while listening to a Spotify ‘Girl Power’ playlist! We are now planning to meet again in a couple of weeks to grout the pots and develop individual vision boards to continue their passions. The pots will be formally presented to the school in an assembly. A special thanks to Tuggeranong Bunnings Warehouse for donating the supplies and their time to teach the girls and make this day happen!